I’m feeling it…. Did you say Candy? You like Candy????? I scream, you scream....we all scream for ice cream! 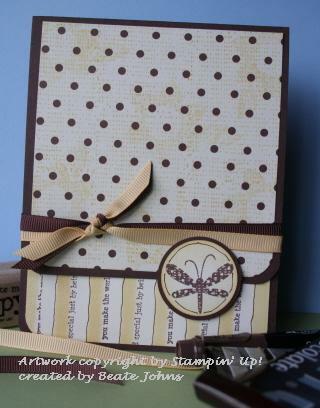 Last night I already decided to use the polka dot paper from the Au Chocolat Designer paper pack. I wasn’t quite sure yet how and with what stamp set though. I kind of decided that I wanted to do the closure Stampin’ Up! showed at convention. To mix it up ,I wanted to have the circle that holds the card closed on the bottom of the card. I just couldn’t decide on a set or what do do on the bottom of the page. The choice of the stamp set was decided by the blog candy as well. I wanted to have a small saying along the stripes. The smallest one we have is from the You make me Happy stamp set. I love that small saying “you make the word special just being in it”. On the other side of each stripe I added a doodled chocolate chip marker line. I started with a 4 1/4″ x 9 3/4″ piece of chocolate chip cardstock. I scored it at 5 1/2″ and rounded all four corners. For the front panel, I cut a 4″ square from the gorgeous polka dot designer paper. I stamped the background stamp of You Make Me Happy on it with So saffron. I also added the smaller flower with a leaf sprinkled all over on the paper. I did stamp off once before stamping the flower on the paper. The inside has a 4″ square of so saffron lined up on the top. I added the saying “You make me Happy” on the top right with a so saffron flower over it. I lined up my stamped paper with the bottom of the inside and then added a 4/16″ strip of chocolate between the saffron on the stamped paper. 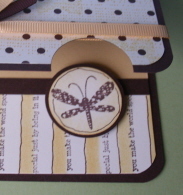 For the closure I stamped the dragonfly of the set on vanilla cardstock. I punched it out with the 1 1/4″ circle punch, sponged it with saffron, drew a border matching my stripes lines and layered it on a 1 3/8″ circle. I added dimensionals on the bottom of the chocolate layer. Then I used the 1 1/4″ circle punch to punch a 1/2 circle in the card front. I closed the card and positioned my dragonfly so that it would close the card. I added some apricot and chocolate grosgrain ribbon and was done. And to really make you understand how early I was up….I finished nine of these beauties already! Five of those will go to my top sellers in my downline beginning of next month. You said that you punched a hole in the card front, but if you did that how is the dragonfly circle coming in front of the ribbon? Sadie, you slide the top under the dragonfly circle to close the card. I just slide the ribbon under as well. Works fine thanks to the dimensionals. great pictures and great explaintion of all your creations! Your blogs on my favorite list! First – MY DD LOVES Junie B! OMG! She has read them ALL so many times it is almost crazy! I love this card! It should go to someone who really cares about you (LIKE ME)….. I love the simple colors on this!! WOW, I can’t believe you have a blog now. This is so cool. When I grow up, I want to be as talented as you. 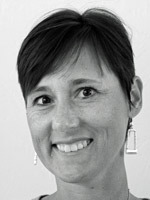 Thanks for all your sharing Beate!! Beate … I lurv this card – its just gorgeous … is that a hostess stamp set? Boy I hope thats one thats in our new cattie in April! I think you should get up at 4 a.m. every day if this is what you can do so early in the morning. Love the colors and everything about this card. And, I love the way you did this stripe background from “scratch”. Congratulations on your new blog. Your card is very beautiful and does match the blog candy I gave away. You have such a good eye for seeing things that people like myself over look. Thanks for the inspiration of keeping my eyes wide open. :)I look forward to more of your beautiful creations. I love this card! I love the polka dots and the butterfly. Fun colors too! What a wonderful card, I cant wait to get the chocolate papers. I love the closure you made, very creative. Hey Beate-I LOVE this card (and of course all of your samples always rock!) I love the black with the yellow and white-so warm and happy looking!! I absolutely love this card. Just got my chocolate paper and have been dying to play with it. I’m a new demonstrator and the closure of your card is something I can really use! Thanks.